lovely daughter, and whose wife had died, married for the second time an ill-natured woman with three ugly girls of her own whose envy of the king's daughter was matched by their treatment of her." They put her to work in the kitchen, and the only clothing they allowed her was "a garment of rushes". That's why everyone called her Rashin Coatie. They fed her upon scraps of food. However, all of this the girl easily endured for before her mother had died, she had given her child a gift. This was "a little red calf, and Rashin Coatie had only to ask the red calf for anything she wanted, and she could have it." Soon the stepmother wondered how Rashin Coatie was not troubled by hunger, and spied upon her, and discovered the secret of the little red calf. She called for a butcher and had it slaughtered. The king's daughter was stricken with grief and sobbed aloud but the dead calf called to her, saying," Tak' me up, bane by bane, And pit me aneth yon gray stane." So the girl picked the calf up, bone by bone, and put it beneath a big gray stone, and knew that she had only to ask the bones, and her wish would be granted. Now came Yuletide, with its feasting and bright church services. But Rashin Coatie's stepmother forbad her to attend services, telling the girl that she must stay home and prepare the Christmas feast. No sooner had the Queen and her three ugly girls gone to the kirk, than the King's daughter ran to the gray stone and told it her plight. 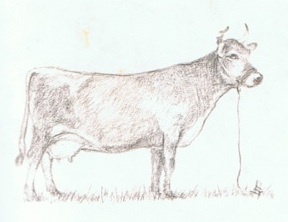 "The calf promplty provided her with braw claes, and she was the grandest and brawest lady at kirk." There was a prince at church and he saw he and fell in love with her. He meant to speak to her after the blessing, but the girl fled before that time. The service continued the next day, and again Rashin Coatie went to church in finery. Again the prince saw her, and now he was more determined that ever to meet this mysterious girl. But again she left before the blessing, so that her family would not miss her. Well, by the third night of Yuletide mass, the prince was ready. He sat by the door, and when the strange young woman tried to slip away, he blocked her way. She dodged around him nimbly, and fled, losing an embroidered slipper of satin. This the prince collected, then proclaimed that he would find its owner and marry the girl who could wear the shoe. The Queen heard this and gathered her three daughters about her. When the prince came to their castle each ugly one took her turn with the shoe. The last girl slipped into the kitchen with the slipper, and begged the hen-wife apply a knife to her toes and heel. Triumphantly the girl walked out wearing the shoe. The prince felt a great unease, yet he had to keep his word. He escorted her out the door, and the two walked toward the kirk to be married. Yet a little bird began to sing, and the prince made out these words: "Minched fit, and pinched fit, Beside the king she rides, But braw fit and bonny fit, In the kitchen neuk she hides." So back they went and the ugly daughter's treachery was discovered. That's when Rashin Coatie came out of the kitchen, and approached the prince "and when she was near, the slipper jumped out of his pocket and on to her foot. The prince married her and they lived happily all their days." 1. Read Rashin Coatie and pay attention to how the girl gets her name. 3. Learn that garment means anything that a person can wear as clothing. 4. Learn that in the USA we would probably call her Rushie Coat, or Grass Dress to describe how she looked. 5. Find Scotland on a map.